At first sight, the uninhabited islands that the Japanese call Senkaku and the Chinese call Diaoyu, appear irrelevant. Looks can be deceiving. The conflict is not about the islands. They have virtually no strategic value. It is about the emerging balance of power between the two great powers in northeast Asia. China has been growing rapidly for thirty years and modernizing its military. Japan has been, not quite secretly, remilitarizing for a decade and has become a normal military power. The New York Times report claims that the current tension is being driven by rising nationalism in both China and Japan. This is a misunderstanding of cause and effect. The real cause of the islands conflict is uncertainty about the true balance of power in northeast Asia. This is almost a textbook illustration of realist theory: military conflict becomes likely if there is uncertainty or disagreement about the balance of power. These islands are part of the First Island Chain that define the ‘Near Seas’ for Chinese strategists. The first signpost of China’s emergence as a great power will be the establishment of Chinese hegemony in these waters. In the South China sea, where the rivals are Vietnam and other minor powers, there is no problem. In the north, China faces Japan and Taiwan, which is a US client. The issue, therefore, cannot be settled without a test of arms. A localized naval battle would help clarify the real balance of forces in the Far East. This is why China is spoiling for a fight. Western powers would do well to let it unfold. Instead of trying to prevent all kinetic action, Western powers should endeavour to keep the conflict localized. By clarifying the balance of power between Japan and China, a limited conflict would promote stability. China ia now following the classic strategy of Weltpolitik. Confronting Japan over the disputed islands is carefully calculated to maximize the probability of American noninvolvement, which is why Weltpolitik is the right term to use. The United States is unlikely to get involved unless there is a threat to mainland Japan or one of its inhabited or strategically valuable islands. The control over these particular islands is kind of up for grabs as far as the US is concerned: this is not a threat to Japan’s territorial integrity. If it were, the US would be issuing red lines right now, perhaps even sending an aircraft carrier into the region. There are limits to coercive diplomacy, however. No great power has ever emerged without a war, and nuclear weapons non-withstanding, if a new balance of power is to emerge, it will only be through a military test. China’s real problem is not even that Taiwan is under US protection. Although it does provide an unsinkable aircraft carrier to the superpower right on China’s coast. The strategic consequences of this fact should not be underestimated. However, Taiwan has grown closer to the mainland and it is likely that it will be absorbed peacefully. Even if the US wanted to, it would not be able to prevent peaceful unification. US policymakers have wisely chosen to be supportive of such an outcome. This is the principal problem of Chinese grand-strategy. In the event that China manages to establish its primacy in the Near Seas, it will come face to face with American maritime power. At this point it will reach the limits of its rise. That is, unless it can solve the principal problem. There are, in principle, two ways to solve China’s energy security problem. China could try to seek naval primacy, gain control of the Strait of Malacca and establish Chinese hegemony in the Indian ocean. This would be much harder to effect. There are no indications of any serious decline in American naval strength, quite the contrary. If China is to gain secure access to energy, therefore, it will have to play on its relative strength: land-based military power. It would be infinitely easier for China to establish military hegemony in Central Asia, to which it has direct land access. It shares a long land frontier with Kazakhstan, Kyrgyzstan and Tajikistan. The oil is, unfortunately for China, on the other side of the region. It would therefore have to overrun all of Central Asia and in effect threaten Russia, to secure access to Caspian oil. If China can build a formidable land force, this goal is achievable. Not only would this enable China to secure access to Caspian oil, it would also give her access to Iranian oil. Iran is likely to remain an enemy of the United States, and given its rivalry with Saudi Arabia, US’ principal client in the Gulf, it would welcome Chinese protection. All of the above ought to be perfectly obvious to the Chinese. Actual conquest of Central Asia is neither required nor desirable. What is needed is, first, to create a situation of strength with the right development and deployment of forces, such that the above war plan can be credibly executed in short order. Second, the Khanates in Central Asia and Iran will need to be brought under Chinese protection. The first would require great internal efforts, and the second will require skillful diplomacy. Once China becomes capable of balancing the US, it will register not just in East Asia, but also in the Caspian. Such a grand-strategy entails a specific deployment of Chinese resources. China cannot hope to compete in terms of sea power with the United States. And given Bloch’s dictum: a blue-water navy that does not command the seas is just a hostage in the hands of the navy that does, China should not be building one at all. Its sea power should be defensive and built for the sole purpose of defending the homeland. This means that it should be contained in the First Island Chain, where it would be relatively easy to establish local naval supremacy with land-based air and missile support. What China really needs is a military capable of invading and securing Central Asia potentially against Russian forces and a limited expeditionary force that the Americans can quickly deploy. This entails a significant outlay over a decade at the minimum. This is not impossible to achieve, by say, 2025. Witness the transformation of the Soviet military in the 1930s. A decade after getting their asses kicked by Poland, Stalin built up a war machine that defeated the Wehrmacht! The United States would not be able to counter China’s land-based forces directly. The real threat will be American air power. US’ formidable air power could, and in most likelihood, will be deployed to disrupt China’s exposed supply lines in the west. China would therefore have to do everything possible to prevent the Americans from achieving air superiority. In effect, it would have to neutralize American air power operating from Afghanistan. Without these developments China will not be able to become a great power rival of the United States. Even if it matches the US in land-based power, and becomes preponderant in eastern Eurasia, it will still be vulnerable to an American blockade of China’s sea-lanes. China has become the world’s workshop, surpassing the United States as the world’s top manufacturer two years ago. It is now Europe’s largest trading partner. China’s external trade is critical to Chinese prosperity and power. 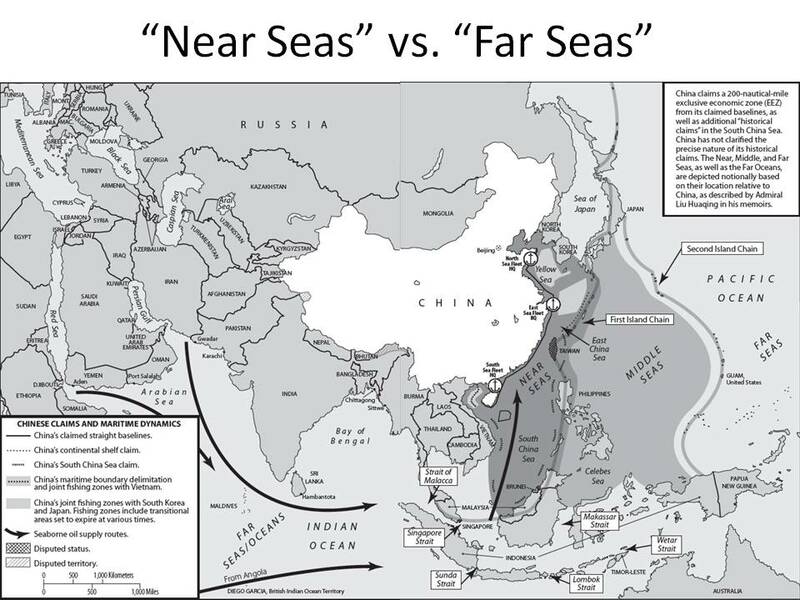 Even if China manages to neutralize US sea power in the Near Seas, the United States would still control the Strait of Malacca. This means that the US would be perfectly placed to coerce China by the threat of cutting off access to the world’s markets. To seriously challenge American hegemony, China would have to challenge America’s command of the seas. This will be a considerable undertaking. It might prove to be beyond the capacity of the Chinese state. At any rate, such a challenge is unlikely to emerge for decades. Chinese strategists reckon that China can overtake the United States militarily by mid-century. Many a rising power makes the mistake of challenging a established hegemon on the latter’s strength. Such costly mistakes are soon corrected. Lessons are learnt on the battlefield.